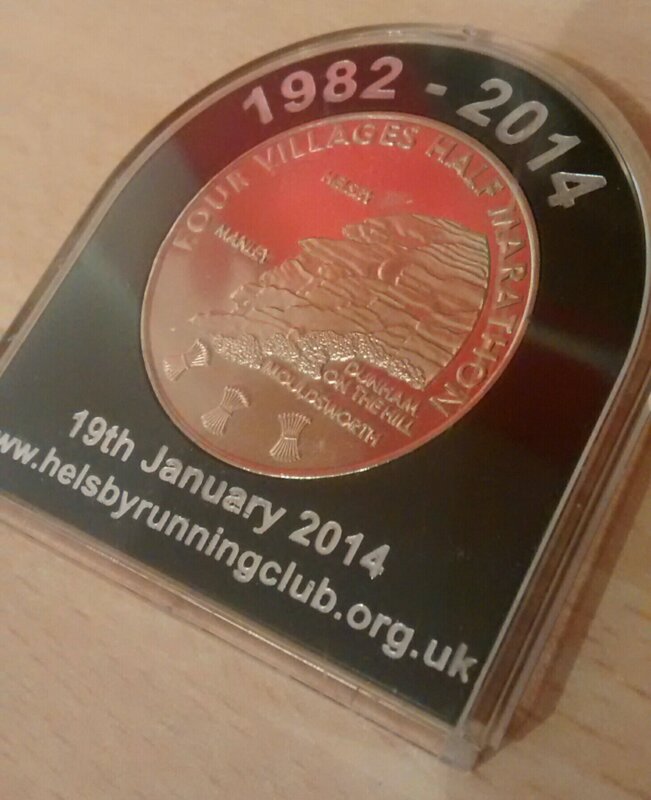 Today was the Essar Four Villages half marathon in Helsby, one of the season openers in the North West of England. Last year I had accepted a last minute entry but it was cancelled due to weather. This year I again accepted an official entry transfer earlier this week. Despite not being running fit (a couple of niggling injuries have prevented me from high-impact running for almost a month), I wanted to use this as a training run. This is the account of my race. My alarm went off at 7am. I was anxious about my first race of 2014. I carbed up with a cheese toastie (freshly cut wholegrain loaf) and ate some fruit mix. A hit of espresso woke me up. The weather was fair – potentially tee shirt weather despite it being mid winter. The air was still and rain seemed unlikely. My friends and I arrived at the race HQ with plenty of time to acclimatise to the surroundings, taking in the hustle and bustle of the event. Lots of club runners and triathletes. No fancy dress runners. This was going to be a fast field. I set myself a modest half marathon time in my head, and as I crossed the start line I started my GPS watch. I shot off, dropping my running friends and enjoying the feeling of my legs turning as I propelled forward through the field of runners along country lanes. The five mile marker appeared before I had time to think about any aches or pains. By mile 8 the course ascended gently and I fought to keep position. By now some runners were overtaking me: I put this down to them running a race with a negative split. I was won over by my logic – I fought my lead legs and picked my pace up once more, developing a steady pace that ate the next couple of miles painfully but surely. By mile 12 I had done some math to pass the time… If I kept this pace up I would beat my desired time. In fact, thanks to my speedy first eight miles I might even get a half marathon PB despite hitting the wall! This buoyed me further and I dug deep, kept a steady pace and even found a hidden energy reserve for a sprint finish. Result: a minute off my previous PB! Beyond the finish line it took all of ten seconds for me to temporarily forget the pain I had been in and start plotting what time I may do my next half (Wilmslow, March ’14) in, given a couple more months training… This running business sure is addictive!